Character information for Wakka, a character in Final Fantasy X. Included are his background, stats, skills, and overdrives. 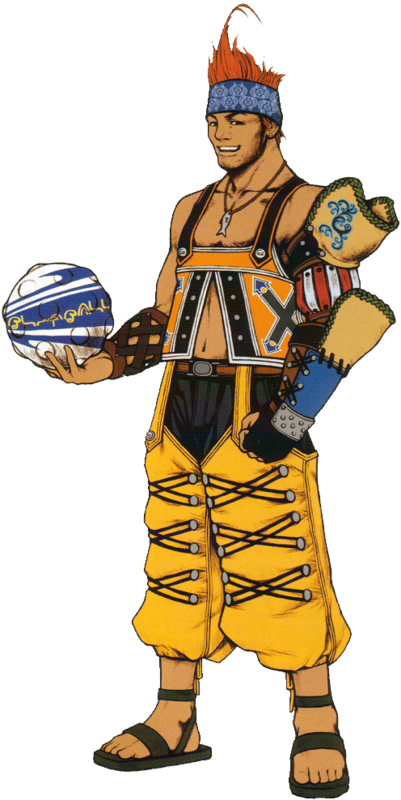 Coach and Captain of the Besaid Aurochs, a Blitzball team that aspires to garner their first win, Wakka resided in Besaid with his childhood friends Yuna and Lulu. Wakka is pious and reveres Yevon, going as far to resent others that contradict its teachings, like the Al Bhed’s use of machina. He offered the weapon Brotherhood to his brother Chappu, but lost his approval. He later joined the party to assist Yuna in her pilgrimage. Similar to Tidus and the others, Wakka fulfills the role of a Guardian. While Tidus excels in close quarter combat, Wakka prefers to attack from a distance using a Blitzball. He and a few others are able to fight underwater. Drain Affects one enemy. Wakka restores HP whenever the target is damaged. Osmose Affects one enemy. Wakka restores MP whenever the target loses MP.